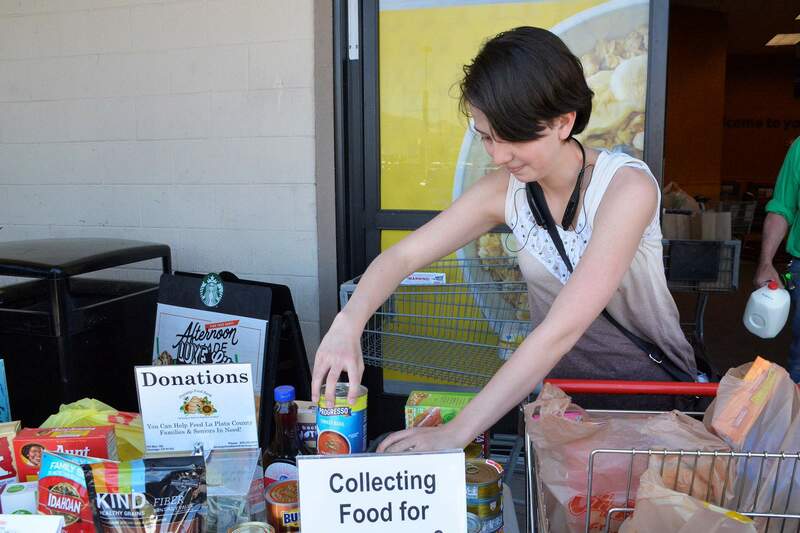 Alyssa Gomez donates food to the Durango Food Bank on Thursday afternoon at south City Market. The food bank is accepting donations for people who have been displaced by the 416 Fire. Holly Hagan, center, donates food to the Durango Food Bank on Thursday afternoon at south City Market. The food bank is accepting donations for people who have been displaced by the 416 Fire. On the left is Rick Crawford, the food bank’s development coordinator, and on the right is John Montle, a volunteer at the food bank. 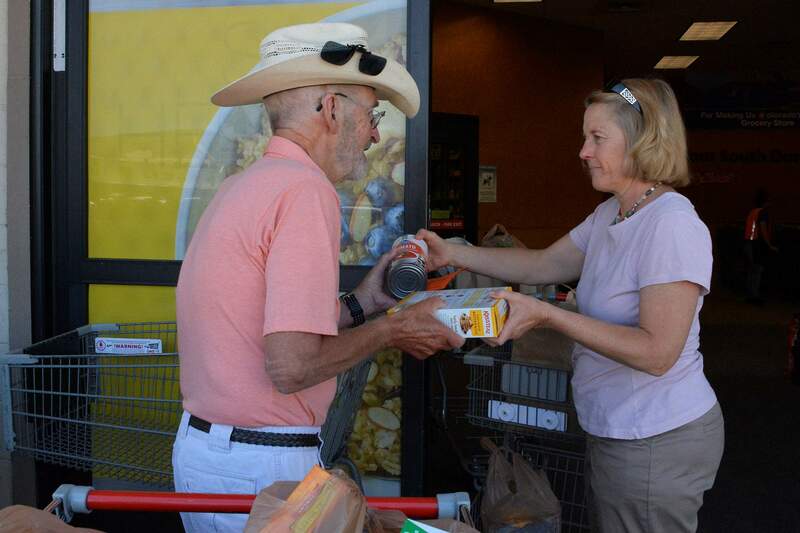 Marsha Porter-Norton, right, donates food to the Durango Food Bank on Thursday afternoon at south City Market. The food bank is accepting donations for people who have been displaced by the 416 Fire. On the left is John Montle, a volunteer at the food bank. 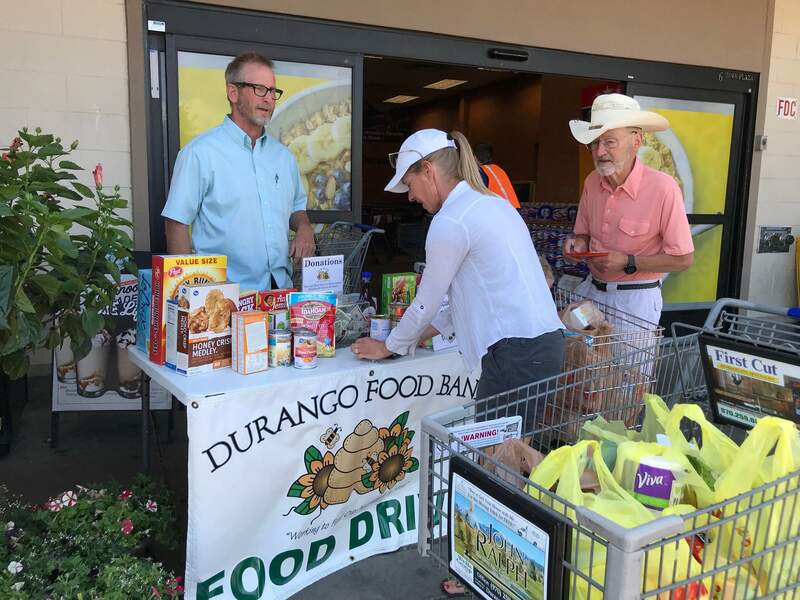 The Durango Food Bank will provide food assistance to those who were evacuated and displaced because of the 416 Fire. The food bank will hold donation drives to collect items for displaced residents from 10 a.m. to 4 p.m. Friday at south City Market, 6 Town Plaza. “While we have a limited supply, we are also going to be distributing household items, including items like laundry soap and toothbrushes,” said Sarah Smith, executive director of the food bank, in a news release. 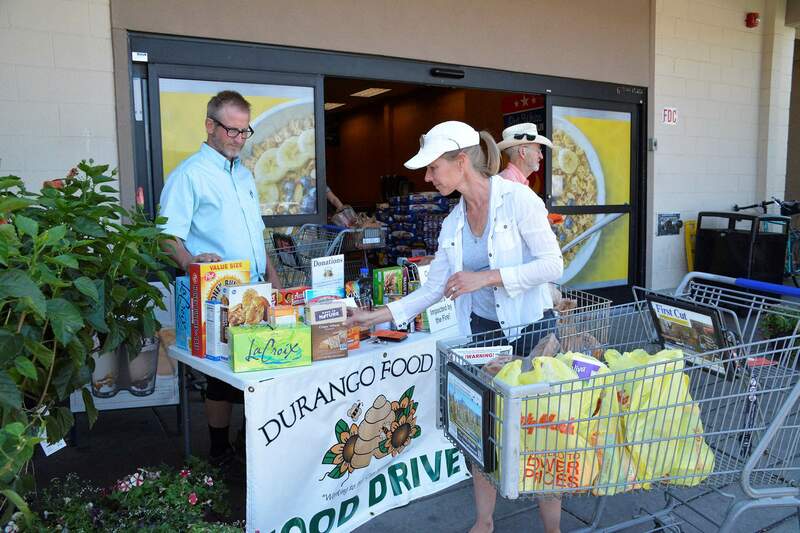 Evacuated residents who need miscellaneous household items and food can pick up donations from Durango Food Bank, 194 Bodo Drive, Suite C. The food bank hosts regular operating hours from 10 a.m. to 3 p.m. Tuesday through Thursday and from 9 a.m. to noon Fridays. Residents who bring Rapid Tag evacuation cards can receive special emergency food assistance. No other documentation will be required to obtain food and household items. For more information, call or email Smith at 375-2672 or director.durangofoodbank@durango.net.